The SYNCRETISTIC PRACTICE of "Christmas" was originally known by the name of "NICOLAITANISM". Named after the "Patron Saint" of it's followers, who was also identified as a Gentile convert "Apostate" in the New Testament. "Nicolaitanism" was marked by the secret practice of pedophilia, with orphans. A legal permission granted to them, by the Roman empire. "Nicolaitanism" has become the "dominant strain" of "Christianity" in the world. "Christmas" is it's center-piece "Holy day". (A practice found no where in the New Testament). And it is a practice not institutionalized in "Christianity" until the 4th century AD. Fraudulent right-wing political operatives bare the title "Religious-Conservatives", but are actually neither, in reality. NOTE: This site is currently being rebuilt. The "Member Password" page that will pop up on links does not mean you are not getting access to the site without membership login information. It is simply being used to keep public viewers off pages, that are in the process of being rebuilt. As each page comes back online, the "Password" page will disappear, and the page will be fully accessible to all. Thank you for your patience. Most people know Christmas is a lie. But because it has mixed itself with some things they consider true, the part of it that is a lie, is relegated to the corner and over-looked as "harmless". This is done primarily because the ministers in America's Churches today, set the example, encourage the activity, and include its celebrations as part of their "Church" life. What most people do not know however, is that for well over 200 consistent years in America, evangelical Christians unanimously considered it to be the worship of the Devil. And this opinion was not based on superstition or ignorance, but rather hundreds of years worth of research into the subject following the Reformation in Europe, where every Reformer in every corner of the Reformation, from Switzerland, to England, to France, to Germany, recognized not only it's error but it's blasphemy. And yes, there really is a very sound theological basis for thinking that. And those opinions about Christmas, did not originate from Protestant Reformers, but actually the earliest Latin Fathers, even among those looked to, as authoritative by the Roman Church itself. In Rome, a Pope by the name of 3 Sixes, made this worship the law of the Roman empire in 435 A.D., and even dissenters in Rome, were forced to remain silent, or face destruction. Today, thanks to the work of the Religious-Reich, America is being intentionally returned to such an era, where objection to compulsory worship of this holy day, is being stamped out, punished, silenced and persecuted, in some places with a vengeance. And the most odd thing is, that leading that charge, are the very descendants of America's own Evangelicals who once knew the difference between an ancient Roman solar-devil, and the Christ it claimed to follow. While it is understandable that certain religions in America would feel personally compelled to observe Rome's solar-mass to Apollyon as a "Christ" mass, it is not understandable that anyone even remotely associated with the term "Evangelical" or "Protestant" would do such a thing, except out of pure ignorance of both their own history, and the theology of the New Testament itself, on this subject. A theology which originally described the syncretistic practice of "Christmas" as "Nicolaitanism", in the New Testament, and even gave it the unconditional promise of damnation. Read this site to find out why such reaction by the earliest Apostolic community, was thought to be no harsh criticism, of what was happening as early as the writing of the New Testament itself. Nor is it understandable how public policies of compulsory participation and support for "Christmas" are being institutionalized, in the United States, where demographically, 70% of America's communities, come from ideologies and theologies which found "Christmas" an objectionable and inconsistent contradiction, with their historical heritages. Nor is it understandable how such Americans, are in favor of laws supporting religious compulsion forcing people to participate in, or physically mouth support for, or conformity to "Christmas", as a condition of education, employment or government service. Yet somehow, this has become the case, in many places in our country. A country whose 1st Amendment of its Constitution, promises exactly the opposite. 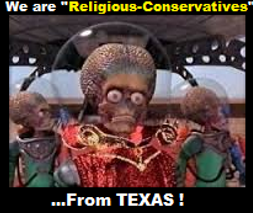 And this is nowhere more true, than in "Red State" America, filled with "religious conservatives"? (An historical paradox of Biblical proportion) A problem which should be easily and quickly remedied if in fact, we were "really" talking about real "religious conservatives" of the historically American variety. But unfortunately, we are not. There is something "new" that has arisen. And it is not trying to "conserve" anything, about America's religious history. It is trying to eliminate that history, and replace it, with something that has been not only antithetical to American religious history, but even anathema, to it. And the title these men bare as "religious conservatives" is as fraudulent, as their "religion". Why is "Christmas" promoted to the point of "compulsion"? Threatening everything from education, employment, child custody to even government service? The answer to these questions are shocking, and not what you have been told, neither as an American, nor as a "Christian". Read the truth about what's REALLY behind the "Controversy" involving "Christmas". A truth, every American has the right to know. THE REAL CHRISTMAS STORY Every year, you will hear Ministers get up and read from the Bible at Christmas. But the oddest thing about THE CHRISTMAS STORY, is that the Ministers never read the parts of the Bible that actually speak about THE CHRISTMAS STORY. (The "real" story that is) Instead they read about the Birth of Christ. All along, admitting they know he wasn't really born then, and isn't really the reason for their Christ-mass? Find out the shocking truth about why the state is being used to enforce compulsory homage of an ancient Roman Icon. Find out what motivated America's original Pilgrims to cross an entire ocean and risk their lives to find religious freedom on the shores of America.... from CHRISTMAS. THE REASON FOR THE SEASON December 14th, 1971, it was openly declared and publicly recorded, in our own Public Congressional Record, that the state's observance of "Christmas" had nothing to do with "Christ". So what does it have to do with then? The truth is that it revolved around the worship of an ancient Roman Sun-god, the worship of which, the ancient Roman Caesar Constantine was said to have been "addicted". Find out THE REAL REASON for the season, that the now familiar but fictitious, "Nativity story" was literally "invented" to hide. The "Christ" they wish to put "back into" Christmas has been CONFUSED with a CHRIST who was NEVER part of CHRISTMAS to begin with. Rome did not ever even intend the REAL CHRIST to be part of CHRIST-MASS. That is the entire reason it was instituted. Rome intended to CREATE an ICON created for the benefit of THE ROMAN EMPIRE, to give Rome absolute power over the hearts and minds of a medieval fascist dictatorship. Find out how the REAL CHRIST, actually prophesied the coming of this Roman Icon, designed to bury his existence, from the very beginning, and warned anyone patronizing this wicked deception would be endangering their salvation. CHRIST-MASS is a central calendar observance of the Roman Mass. A practice started out of anti-Semitic hatred of Jews, openly confessed by the Nicene Council, and created as a substitute for the Passover Seder commanded by the REAL CHRIST. The real Christ admittedly never had anything to do with a Roman Mass, and commanded his disciples to keep the Seder. The Mass, established as a counter to the Passover, [though celebrated by followers of Christ for centuries] was actually outlawed, as a crime against the state of Rome. The mystery of the "Patron Saint" of CHRIST-MASS is no mystery. "Saint Nicholas", known as an ambiguous "early saint" who suddenly acquires a new history called "tradition" in the after-math of the Iconoclast wars in 847 CE. Find out how the "Patron Saint" of CHRIST-MASS, "Saint Nicolas" was long known before 847 CE and how he, as the association today suggests, is the actual "founder" of CHRIST-MASS (father Christ-Mass). What you are not told is that when he "founded" this syncretistic practice between devil worship, and NT faith, it was condemned as immoral filth, and cursed with eternal damnation. "Solar-mass Apologists" crusade the internet informing people an obvious reference in Jeremiah to a Tree being cut down, placed in a stand, and decorated with silver and gold have "nothing to do with their Christmas tree". Unfortunately, the historical practices of the winter solstice in the Middle East are well documented by modern archeologists. The fact is that Mithraic practices were being assimilated into Israel [known to all historians] and reflected in these texts in Jeremiah, where both the ancient festival and thus its modern practice, is thoroughly denounced in scores of texts. Ever wonder why CHURCHES have STEEPLES on them? [Old English for "Tower"]? You might be surprised to discover it has to do with the Christ of Christ-Mass, Constantine intentionally named THE FIRST CHURCH he built, the THEA SOPHIA, after the False Christ of the Egyptian Gnostics. The CHURCH created to celebrate CHRIST-MASS was ACTUALLY created to fulfill both the roles of the "bride of Christ" and "whore of Babylon" (at the same time) due to the influence of Eastern Monism prevalent in Roman "mystery religion" of the era. We are constantly told the "Spirit of Christmas" is every ideal of human warmth and kindness to BE celebrated by all? Jews, Muslims and even Atheists are "expected" to "join in" without question or hesitation in this "holy day" promoted by the State. Why is it that NO ONE [including your Pastor] bothers to ever tell you, the name of the man in Rome who established this "holy day" as State law, was actually named 666! Literally! And yet most Christians today have never even heard of him! The "Spirit of Christmas" is actually the "spirit" of "666". Precisely the name of the man, who institutionalized it, as compulsory law in the ancient Roman empire. THE MAGIC OF CHRISTMAS Find out how this "magic" is prophesied in the New Testament, and not the kind of "magic" you would want to participate in. There... it is called a magical "delusion". "Christmas" is in fact a "magic ritual". But it is one that swaps the definition of the Biblical God, for an entity that is described in the New Testament as a "false Christ" that would rule over followers of the Antichrist himself. There it is described as the great "Delusion". The same term employed by Charles Dickens himself upon writing THE CHRISTMAS CAROL, and the "vicious caricature" of Ebenezer Scrooge, on its behalf. Unlike the "image' it's promoters constantly create on television, CHRIST-MASS is by far the saddest, most depressive, and even deadliest times of the entire year. Find out how its practices have been implicated in everything from the actual cause of divorces, to financial ruin, to even death itself. Find out how the true "devastation" of this practice runs both into the billions of dollars and impacts our lives in ways we rarely are allowed to realize. Find out how it negatively affects not only on our personal lives, our marriages, our finances, but even our national economy, our environment and our "spiritual lives". The Christmas productions of GRINCH and SCROOGE on closer examination are full of intolerance against people who, for "conscientious reasons" preferred not to participate in Rome's Solar-Mass, now called a "Christ" mass. Who were these "awful scrooges"? They were Jewish & Protestant New England "FOUNDING FATHERS". And while they had no desire to celebrate Rome's Solar-mass, they were opposing Rome's slavery in the South, where the first "Christmas" in America was made STATE LAW, thanks to Valladolid Catholicism promoted by Jesuit slave-traders in Southern slave-port cities. YES VIRGINIA, THERE IS A SANTA CLAUSE! Unknown to most Americans, and most Christians, the famous letter written by Francis Pharcellus "Church" to "Virginia" O'Hanlon has a whole lot more history and symbolism behind it than what most are told. In fact, the "famous letter" marked a turning point in American history toward religious delusion. The symbolism of the letter itself was promoted as Masonic Iconography of the "cooperation" between the Masonic order in America and the Vatican, over its mutual worship of Apollyon as Christ, i.e., "Sun-worship". The genre of institutionalized "Hate Propaganda" known as "THE GRINCH", is actually an intentional application of stage 3 of the genocide process, in which target minority religious and ethnic groups are compared to Animals/Insects. This is done as part of the process of social "branding" to precipitate persecution and even violence. "Institutionalization" of this religious hate literature receives support from enemies of American freedom and democracy, to undermine its Constitutional Separation of Church and State. Evangelicals have been seduced by false claims, promoted by new Neo-Romanists. There is neither a Biblical basis, nor a historical precedent for eliminating our form of Constitutional government, for a parochial Church-state Theocracy. The 1st Amendment was a principle established by New England Puritans seeking protection for all Americans from the abuses of the Roman empire. "Restoration" of the U.S. as a "Christian" nation, is nothing more than political code for justifying the establishment of the (i.e., Holy Roman empire a/k/a Third Reich) in the United States.